The trailer of Aamir Khan starer ‘Dangal’ has just been released and as we all know, Aamir plays the character of Mahaveer Singh Phogat. It is a real life story and focusses on wrestling and Phogat’s achievements. 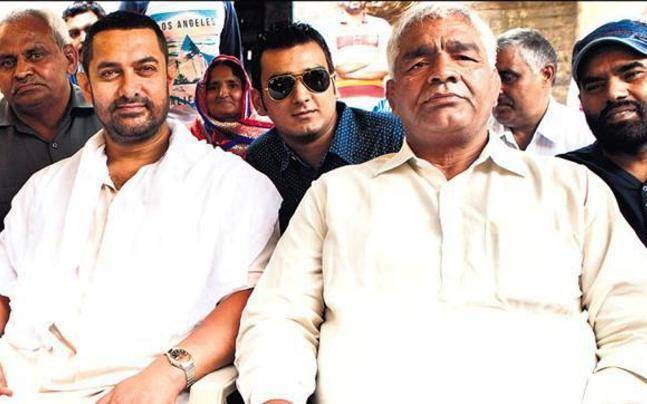 Every Father in India needs to learn from Mahaveer Singh Phogat who himself was a state champion in wrestling. He had four daughters, Babita, Geeta, Ritu and Sangita. Staying in the village of Balali in Haryana’s Bhiwani district, Mahaveer Singh Phogat trained all of his daughters to be rough, tough and world-class wrestlers. Geeta won gold and Babita won silver in the Commonwealth Games held at Delhi in 2010. In 2012, they won a bronze medal each in the World Championships of Wrestling. Also in 2012, Geeta became the first Indian female wrestler to compete in the Olympics, held at London. His two younger daughters, Ritu and Sangita, along with his brother’s daughters, Vinesh and Priyanka, also took up wrestling. Phogat took it upon himself to train all these girls. They train every morning and evening after school/ college. They started by competing in the local grounds and were slowly moving up the ladder. In 2014, Babita and Vinesh won Gold Medals at the Commonwealth Games in Glasgow. The Phogat sisters’ hard-work inspired a lot of girls around them as well as in other parts of the country to emerge from the patriarchal society and chase their dreams! Mahaveer Singh Phogat’s feat is commendable because he took it upon himself to train his girls in a sport that is traditionally male-dominated. Haryana still being a patriarchal society, it must not have been easy. Mr. Perfectionist, Aamir Khan, will be portraying this strong character in the movie ‘Dangal’. The movie will release in Christmas this year and will definitely be worth the wait! Upcoming Bollywood Movies That Will Give 2016 an Amazing Finale!